For this Savage realm of Suzerain enjoy an old school killer dungeon in a fantasy setting that draws heroes from every corner of time & space. The Lich Queen has trapped your heroes in her ever-shifting labyrinth. They've survived the Tome of the Lich Queen, but now they enter the machine level - the inner workings of the dungeon. Left or right, fight or hide, rescue an angel or ally with a demon...make your choices carefully. Welcome to the meat grinder! Inside you'll find all you need to run this unique setting, all the background information and encounters that will challenge any party of Heroic characters, plus the stats for all manner of new NPCs and critters. Product Contains: A stunning 120 page PDF detailing every evil twist and turn in the dungeon. The book is layered so you can switch off the ink-devouring elements to create a print-friendly version on the fly. Note, this is the Pathfinder version of this book. Will you be offering a print version of this revised module in the future as you have done for the first installment of the trilogy? For me, if I make the investment to get the print version of the first part of the trilogy, then I also want to be able to get the remaining installments in the same format. Absolutely, Michael. 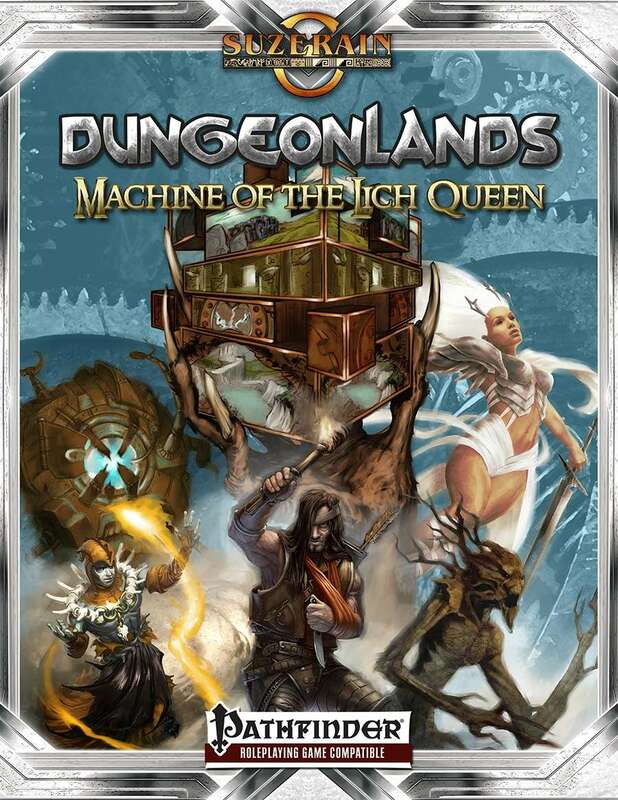 In fact, we're working with DriveThruRPG the last few weeks to bring Machine of the Lich Queen to print. There was an error in the print proofs (which is why you do print proofs, of course) but it has taken some time for the folks here to figure out what it is. I understand that new proofs are due out in the coming week and so we should have the new version of the print book available very soon now. We're very sorry for the delay. Hey Marco! Apologies, it was a human error moment. The wrong price was entered, and it was entirely my own fault. I think you'll find the $19.99 price much more agreeable! Thanks very much for letting us know about the error, after all we cannot fix something we do not know about. If you have any other questions or feedback please don't be bashful about reaching out to me directly, loki@savagemojo.com, and I'll make sure you have an answer asap. Gayle Reick: Chris Bivins, Nicholas Cloister, Jessica Cox, Dennis Darmody, Jason Engle, Bien Flores, Jim Pavelec, Alida Saxon, Carly Sorge. This title was added to our catalog on August 29, 2014.